WASHINGTON — The Trump administration is poised to roll back a significant climate change regulation on coal-fired power plants, making it easier to build new coal plants in the United States. The Environmental Protection Agency is expected to announce the plan on Thursday, according to four people familiar with the administration’s proposal who were not authorized to speak about it publicly. The proposal will eliminate Obama-era restrictions on newly built coal plants that in effect required them to include systems to capture the carbon dioxide they produced — a technology that is still not in use on a commercial scale. The replacement measure eases those constraints, sending a powerful signal to the coal industry, as well as to other countries struggling with the political difficulties of addressing climate change, that the United States is trying to pave the way for coal-burning plants. The move is not expected to lead to the immediate construction of new coal plants, which aren’t financially viable because of a combination of cheap natural gas and other environmental regulations. But the Trump administration’s proposal is the latest message that the federal government is embracing the industry. “This says we’re expecting more coal-fired power plants in the future, and we’re going to make it easier to get there,” said Richard J. Lazarus, a professor of environmental law at Harvard University. A spokesman for the E.P.A. did not respond to a request for comment on the agency’s plans. 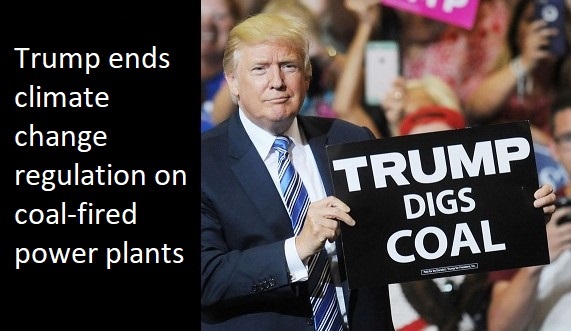 Under the Obama administration plan, first proposed in 2013, carbon dioxide emissions from new coal plants were so severely limited that the rule effectively blocked new construction unless plants were outfitted with carbon capture and storage technology. The Trump administration intends to allow new coal plants to move forward, as long as they use newer and more efficient boilers and related technology than previous generations of facilities, according to the officials familiar with the proposal. Under the Trump administration’s rule, carbon dioxide emissions from new coal plants would not be allowed to exceed 1,900 pounds of carbon dioxide per megawatt-hour of electricity, according to two people knowledgeable about the proposal. That’s compared to the Obama rule, which limited emissions to 1,400 pounds of carbon dioxide per megawatt-hour. The rollback comes as delegates from nearly 200 countries are meeting in Poland to design a set of rules for the Paris Agreement, the 2015 accord that called on countries to voluntarily scale back planet-warming greenhouse gas emissions. The Trump administration has pledged to withdraw from the Paris Agreement, and at the Group of 20 meeting in Buenos Aires last week the United States declined to promise to uphold global climate change commitments. The administration is expected to send officials to the climate conference next week to hold a side event touting the benefits of coal. The administration has also worked to promote coal consumption abroad. Last month, Energy Secretary Rick Perry traveled to Poland to promote coal along with liquefied natural gas exports. And Andrew Wheeler, the acting administrator of the E.P.A., is a former coal lobbyist who in an interview last month declared that coal’s global future remains bright. The same can’t be said in the United States, where since 2010 nearly 40 percent of the nation’s coal fleet has either been shut down or designated for closure, according to the American Coalition for Clean Coal Electricity, a trade group that represents utilities and mining companies. Joe Aldina, director of coal analytics at the market research group S&P Global Platts, said he did not believe the revised E.P.A. rule would change the economic outlook for coal. Still, he said, the Obama-era rule had a “psychic impact” on the coal industry, which felt it was under government assault. “It was this feeling that you’ve blocked off the lifeline for the industry going forward,” he said of the original restrictions.